There are many different types of chemical storage and methods of how that chemical storage should be stored. Flammable chemicals need extra attention when storing or handling. 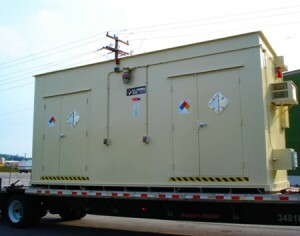 Many fire rated chemical storage buildings offer a safe and protected housing for your flammables. Before storing your flammable chemical storage, it is necessary that you do thorough research on the chemicals that are being stored or handled and follow the proper rules for storing those chemicals. Flammable storage can be very dangerous and if stored improperly can lead to hazardous situations and possibly death. It is necessary to follow proper storage guidelines when storing your flammable chemicals. Fire rated chemical storage buildings offer a safe and compliant way to keep your flammables and the surrounding environments safe. US Chemical Storage offers a 2 hour fire rated chemical storage buildings and a 4 hour fire rated chemical storage building designed to house your specific flammables. Our fire rated chemical storage buildings are 100% compliant and fully customizable to tailor to your exact specifications. All of our buildings, including our fire rated chemical storage containers, exceed all EPA, OSHA, NFPA regulations and FM Global & Warnock Herey approvals. Our flammable storage buildings can be modified with our wide variety of optional accessories to make your flammable storage 100% compliant. Featured with an EPA compliant, leak-proof spill containment system for containment of flammable spills or leaks. Our FIRELoc Chemical Storage buildings can be set 10-30 feet from your facility to make your manufacturing operations efficient and effective. Our durable steel construction adds the ultimate security and protection that you need for your facility, your investments and your personnel. Keep your fire rated chemicals safely stored with a FIRELoc chemical storage building from US Chemical Storage.